Rob, you say - it's been a little while since we talked about Layer 2 Security (almost a week) - does that mean that we're done? Not a chance - we haven't talked about Private VLANs yet! A VLAN is often defined as a "broadcast domain", and in most cases is co-incides with an IP subnet. Private VLANs (also called PVLANs) are the exception to this, a Private VLAN is still usually a single IP subnet, but the "broadcast domain" definition no longer holds true. 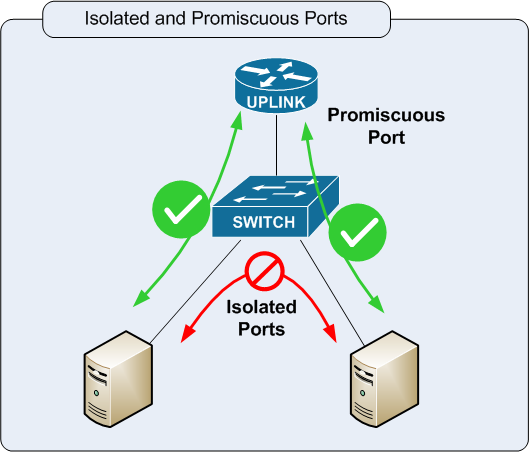 In a private VLAN, you start by defining an "uplink" port (also called a "promiscuous" port). This is normally the port (or link aggregation group) that is attached to the uplink router(s), firewall(s), provider network or server(s). After that is set, you define "isolated" ports. Any frame received on a isolated port is forwarded only out the uplink port, no matter what destination MAC or IP address it might have. This includes ARP traffic or any broadcast traffic. Frames received on the promiscuous port are then forwarded in the usual way - ARPs, Broadcasts and all other layer 2 frames work as you would expect them to. So what this means is that isolated ports in a Private VLAN cannot "speak" to each other at all - their only traffic path is via layer 3, to other subnets or to other isolated ports in that PVLAN. The concept of private ports can be expanded to include larger port groups - this concept is called "community" ports. 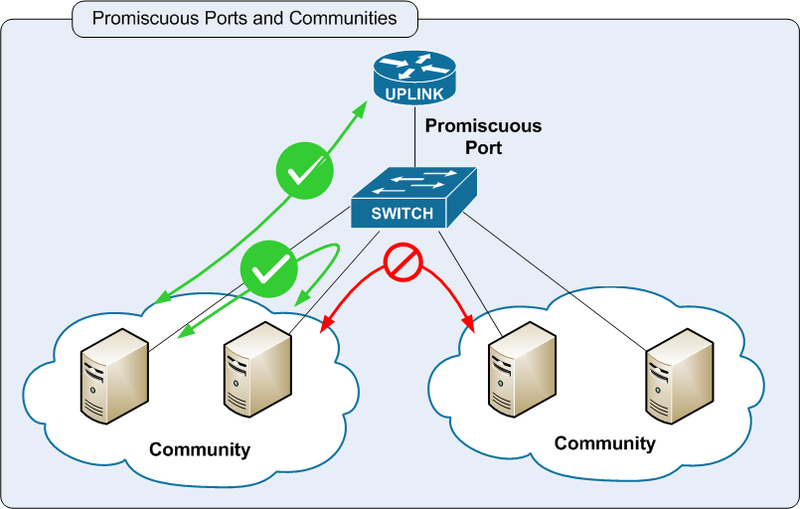 Community ports can speak to each other via layer 2 just like a regular vlan, but are separated from ports in other communities, and from isolated ports. As always, if there are any errors in this diary, or if you'd like to comment with other examples of how you've seen PVLANs used, feel free to use the "comment" link. Adobe released a new version of the Shockwave Player for Windows and OSX yesterday. Multiple vulnerabiltiies are addressed, most of the vulnerabilities on the list result in compromise of the workstation and arbitrary code execution, so this is an important update to get done ASAP. Several readers wrote in to note that the .de domain (Germany), which is operated by DENIC , had an unplanned outage earlier that lasted a bit over an hour. There is no official statement yet, but according to one source , a bad zone file was loaded and it took a while to fix. Currently, .de domains appear to be reachable again.